It’s been a week here, feeling much better and way over my cold. 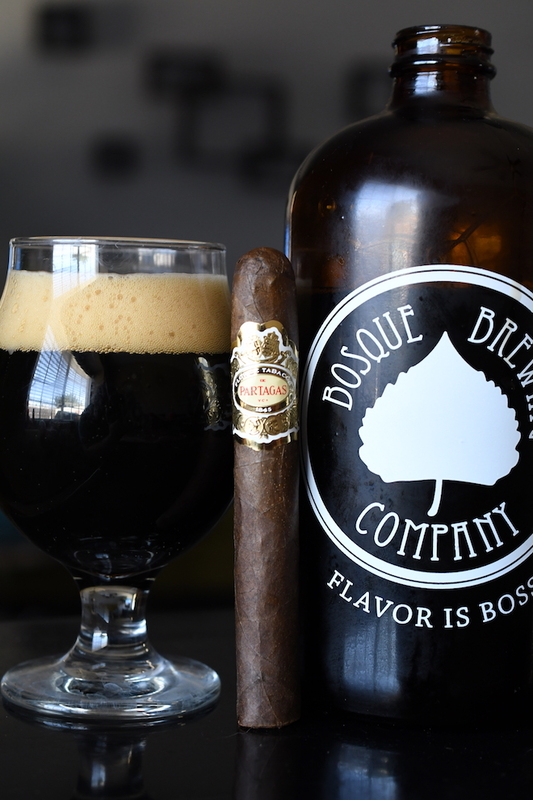 Its time to enjoy this amazing weather with a Partagas Ramon y Ramon paired with a growler of Bosque’s Sangre de Coco. The Partagas Ramon y Ramon was one of many cigars that made their debut for General Cigars at this past year’s IPCPR show in Las Vegas. 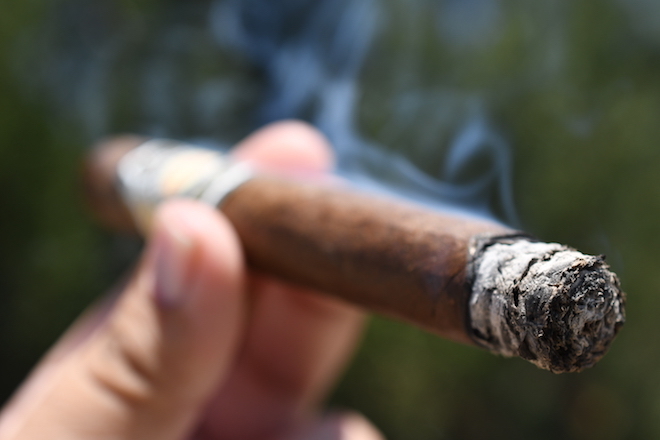 The cigar is produced with care using seeds that the company has stored in a vault from almost five decades ago. The seeds are modified and then produced to create some of the blends we enjoy today. This is the same process used to create the Macanudo Mao, except this particular blend uses seeds from Ramon Cifuentes Toriello who was the previous owner of the Partagas brand. The Ramon y Ramon blend utilizes this vintage seed which is farmed in the Dominican Republic as well as a Dominican Piloto Cubano and Nicaraguan fillers from the Jalapa region for it’s fillers. The binder is from Dominican Republic and the cigar is wrapped in a Cameroon wrapper. The Partagas Ramon y Ramon comes in four sizes: Robusto (5 x 50), Maxim Grande (6 x 52), Fabuloso (7 x 54), and the Gigante (6 x 60). All of which come in boxes of 20 ranging between $7.49 and $8.99 a stick. Big thanks to the General Cigar team for sensing samples our way to review. 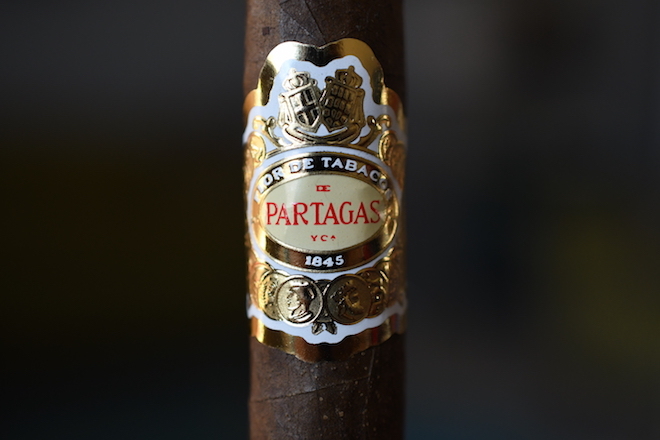 The Partagas Ramon y Ramon starts out with a rustic looking, medium brown wrapper. The wrapper is pretty rough looking with lots of splotched dark brown, orangish-brown, and yellowish -brown areas scattered throughout. The wrapper feels extremely thin and delicate, with some soft oils, and mild tooth. 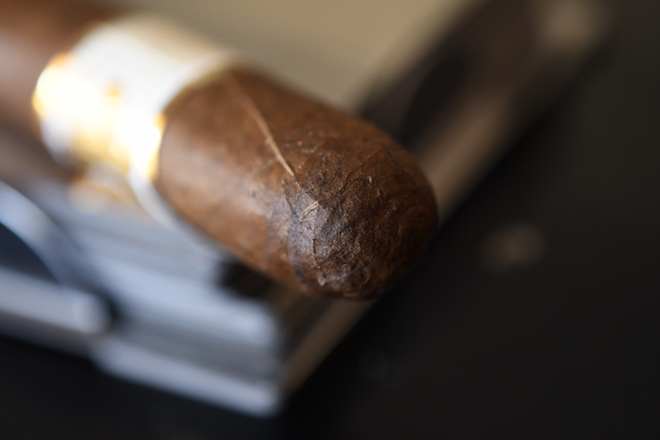 The wrapper is laid seamlessly over itself as it leads from the long body of the cigar up to the round, double-wrapped cap. The cigar is polished off with a very detailed, yet elegant, white, yellow, gold and red band with the Partagas crest displayed in the front. 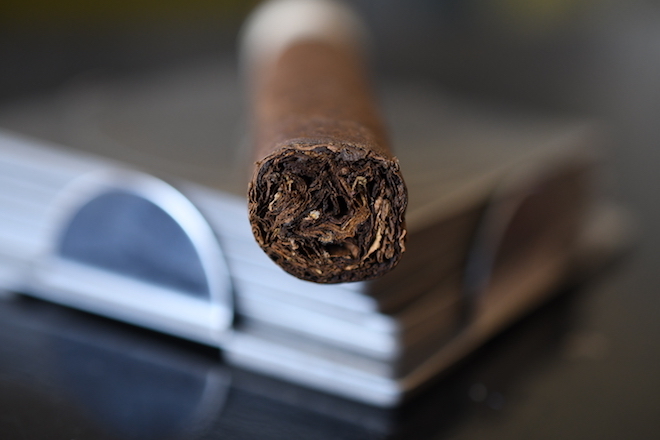 The cigar is a big soft and spongy, but nothing to really be concerned about. Let’s just hope the draw isn’t too loose. 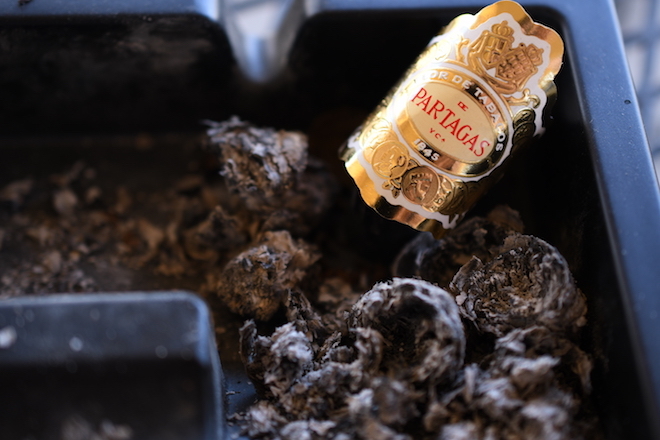 The wrapper on the Partagas Ramon y Ramon gives off a very nutty, earthy aromas while the foot of the cigar has some very mild spice and tobacco scents. Not much going on there. The cap cut clean and easily using my Xikar double bladed cutter. The cold draw produces some mild spice, dirt, musk, and nut flavors. The Partagas Ramon y Ramon starts out with a pretty impressive pepper boom that I wasn’t expecting at all. Once the pepper started to fade I was greeting with some bold floral and musk flavors, great nutiness, clove, sweetness, and this awesome pine type taste that cameroon can only offer. The draw on this cigar is magnificent. 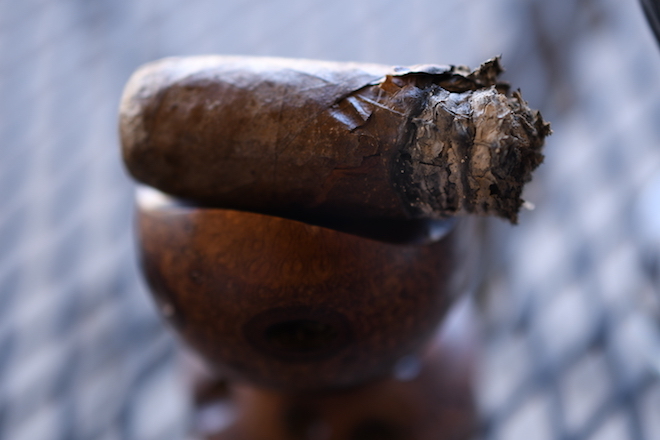 Each little puff kicks out a massive cloud of thick, white smoke while the cigar pours like a chimney as it rests in my ashtray. The burn line is razor thin and dead even leaving behind a trail of medium and dark gray ash which held on for about in inch before falling into my ashtray. Into the second third of the Partagas Ramon y Ramon and the body is still way up in the medium/full arena. The flavors are leading with the clove and pine backed by spice, musk, soft nut, and a bit of chocolate and coffee. The retrohale really helps bring out the pine and clove. the burn line is still rocking dead even while the cigar is burning at an average rate. I close out the second third with nothing in terms of nicotine. 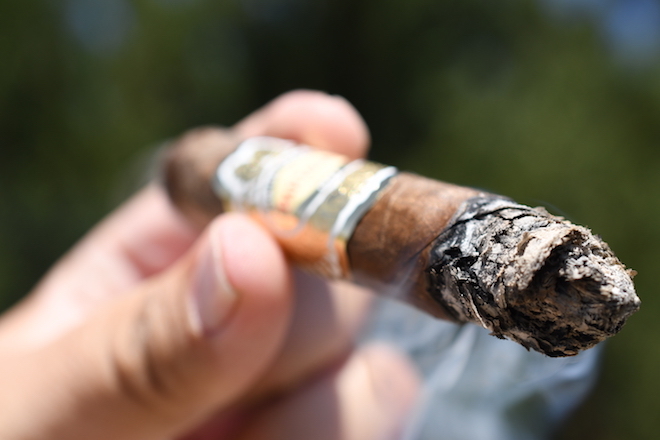 The flavors have still been pouring it on in the final third of the Partagas Ramon y Ramon. While most of them balanced out a bit that pine is still rocking hard backed by spice, musk, nut, clove, coffee, and cocoa. It took me about an hour and a half to take this cigar down to the nub and I loved it the entire time. The cigar finishes really clean despite being so full of flavor. No harshness, no extra heat, and only some very slight nicotine. I really need to get more of these. I’ve come to the conclusion that I don’t smoke enough Cameroon cigars. When they are done right, they can really offer some bold, unique flavor profiles. In the case of the Partagas Ramon y Ramon this is Cameroon done perfectly. The cigar carried way more body than I was expecting, and the flavor profile was complex, and not something I encounter often. Again, I need to smoke more Cameroon. The price of this cigar is exactly where I’d expect it to be and I could easily see this cigar slotting into my regular rotation. One of the huge upsides about living in El Paso is how close we are located to Las Cruces, New Mexico which houses a great little taproom for Bosque Brewing out of Albuquerque, New Mexico. Bosque has been a local favorite of mine for a while, and one of the beers I’ve enjoyed the most as of late is their Sangre de Coco. Sangre de Coco is an Imperial Brown ale brewed with coconut which comes in at a modest 8.5% ABV. The beer leads with a ton of sweetness, coconut, almond, milk chocolate, roasted malt, and a bit of coffee with a very light mouthfeel before finishing even sweeter with more coconut and chocolate and a nice coffee aftertaste. This beer honestly reminds me of liquid Almond Joy. 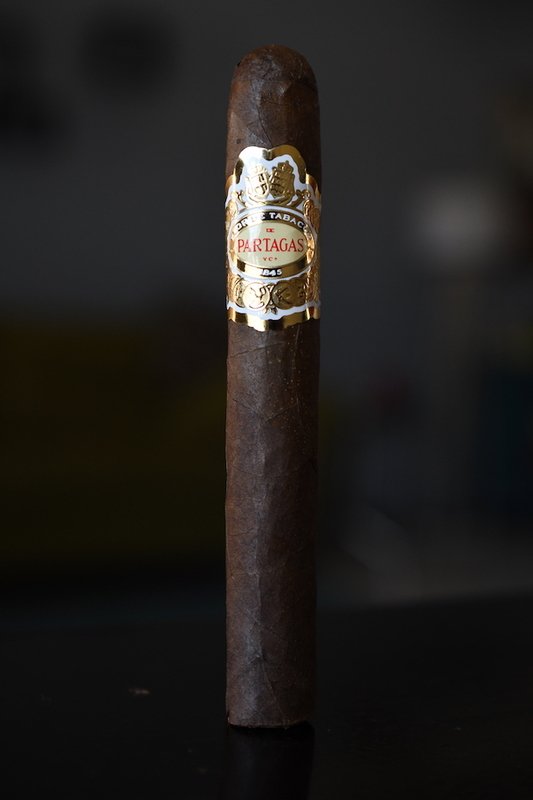 While the flavors weren’t an exact match for the cigar, I knew that I wanted something a little bolder to pair with the Partagas Ramon y Ramon to really bring the body out of the cigar. I really enjoyed the flavors in the cigar, but thought that with a bit more sweetness this cigar could really get to a whole new level, which in fact it did with this pairing. Man, that sounds great! I love a good Cameroon. Do coconuts bleed? There is cigar is unbelievably good! Dang, man, thanks for hooking it up!